People wearing Strava-enabled fitness trackers appear to have been poking around a Thames shipwreck containing nearly 1,500 tonnes of explosives from the Second World War. In addition, other fitness fanatics appear to have been wandering around military training sites – including danger areas used for live-fire tank and artillery training. The information came to light after social media users realised that the latest version of Strava's heat map, which shows the aggregated routes of all of its users, could be used to figure out where Western military bases in the Middle East are. Fitness-conscious soldiers, running around the bases' perimeters, built up visible traces on the heat map over time. However, of much more concern is the revelation that people have been poking around the wreck of the SS Richard Montgomery, a Second World War cargo ship that was carrying thousands of tonnes of explosive munitions from America to the UK. The ship grounded in the Thames Estuary, in England, in August 1944, barely two miles north of Sheerness. Although wartime salvage parties managed to scavenge a large amount of ordnance from the grounded Liberty ship, her hull split in two and sank, taking around 1,400 tonnes of explosives down with her, before the job could be completed. Officials decided to leave the wreck in place. According to a 1995 survey report on the wreck: "The bombs thought to be on board are of two types. The bulk are standard, un-fused TNT bombs. In addition, some 800 fused cluster bombs are believed to remain. These bombs were loaded with TNT. They could be transported fused because the design included a propeller mechanism at the front which only screwed the fuse into position as the bombs fell from an aircraft. All the bombs could therefore be handled – with care – when the accident occurred." Although the New Scientist bellowed in 2004 that an explosion would "bring death and devastation to a wide area", the truth is (shocker!) more nuanced than that. The 1995 report noted that TNT "does not react with water and will not explode if it is damp", before adding that the brass-cased cluster bombs' lead-based fuses "will combine with brass to produce a highly unstable copper compound which could explode with the slightest disturbance". Although the compound "if formed, will wash away in a few weeks", it was not made clear in the report how often the compound forms and creates the dangerous hair-trigger condition. 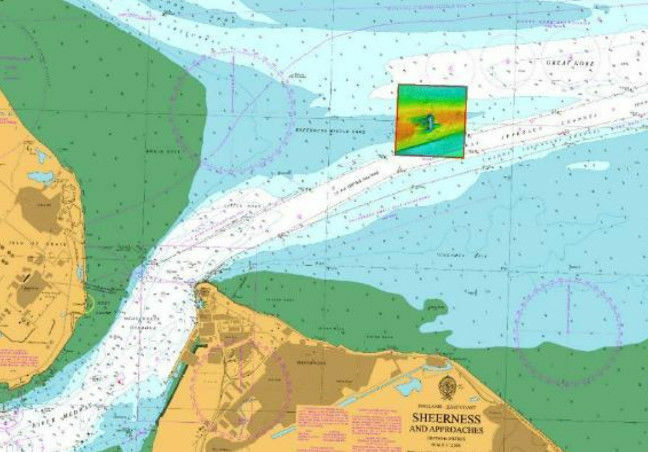 Experts believe that the best way of keeping the wreck safe is not to disturb it, which led to a 500-metre exclusion zone being imposed around it. The UK Maritime and Coastguard Agency confirmed to The Register: "There are legitimate activities within the prohibited area relatively regularly. These are our own surveys, which can involve going within the prohibited area a few times a year, added to which the survey pattern will, in some cases, involve going through the prohibited area quite a few times in each survey. Also, the regular checking and maintenance of all of the buoyage around the wreck and the warning signs will require going within the prohibited area and the port authority, on contract to the MCA, use harbour patrol and pilot vessels to monitor the wreck and, in order to do that, they have permission to enter the prohibited area." El Reg had a quick squint on the Strava heat map at Castlemartin Ranges, which is a military training area in southwest Wales, immediately south of Milford Haven, used for tank and artillery live firing. The place where the shells land and explode is called the impact area. As you can see, there are a surprising number of tracks across the range. It may be the case that Royal Armoured Corps or Royal Artillery personnel are wearing Fitbits or other fitness trackers while bouncing around the ranges in their armoured vehicles. Perhaps even explosive ordnance disposal personnel who enter the impact areas to safely destroy "blinds" (fired shells that failed to explode) were wearing them too.